Yesterday I was sitting here listening to Harold McGee on NPR’s “Radio Times” with Marty Moss-Coane promoting his new cookbook. Harold is a food scientist and author, with a regular column titled “The Curious Cook” in the New York Times. On the radio show this morning, Harold gave great tips for preparing your Thanksgiving turkey. I’m a big fan of Harold’s first book, referring to it often, so I’m sure this new one will be no different. “Keys to Good Cooking” is built to use in combination with recipes or cookbooks. This book focuses more on culinary tricks that are not well known, methods of cooking as well as detailed descriptions of foods. Chapters include: Kitchen Tools, Heat and Heating Appliances, Cooking Methods and more. The book is available in hardcover as well as Kindle version and an iPad version through iBooks. I was happily surprised to hear some of Harold McGee’s Turkey Tips, so I decided to share them with you. I have read and always believed that brining a turkey was a good idea. Harold agrees that brining a turkey will definitely make the meat more moist, but he still does not brine. Not only can it make the bird too salty he says, but it will especially make the drippings used in the gravy too salty. Then when you reduce the drippings, it will be way too salty. So how does Harold recommend getting that perfectly juicy bird? Chill the breast meat BEFORE putting it into the oven. Harold recommends using ice packs to chill down the breast meat for 15 to 20 minutes while the rest of the bird comes to room temperature before putting the turkey into the oven and after it has thawed in the refrigerator. The idea behind this method is that there will be a 8-12 degree difference between the breast meat and the dark meat in the thighs and both meats will be able to reach their desired temperatures at the same time. For the more delicate white meat, the desired temperature is 155 to 160 degrees F, and the tougher dark meat between 165-170 degrees F. Therefore, by starting to roast the breast meat colder than the dark meat, both will reach these desired temperatures at the same time and you will not overcook your bird. This also means a more juicy bird. 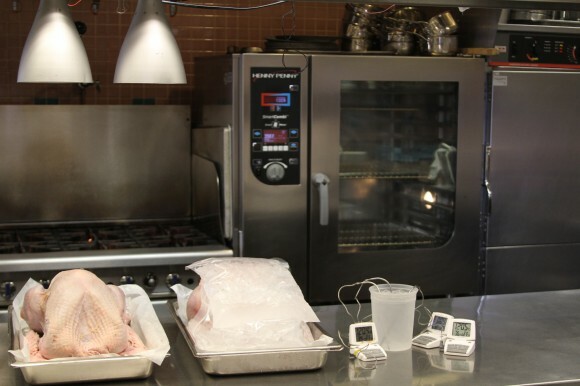 The team over at the Kendall Jackson kitchen decided to test out this theory by cooking two Turkeys – one with chilled breast meat and one without. They found McGee’s method to work and produce juicier breast meat. You can read more about their experiment here. His second great tip covered whether or not to stuff the bird before roasting. Harold recommends skipping out on stuffing the turkey because it is only a recipe for overcooking the bird. In order for the stuffing to be safe to eat, it needs to reach a temperature of 165 degrees F, which means the outer portions of meat will most likely rise above this temperature, leading to drier and overcooked meat. Harold’s third tip was about measuring ingredients. He recommends that you use a scale rather than measuring cups or spoons for measuring out many ingredients, therefore measuring their weight rather than their volume. For example, Harold brought up the different weights of salts. Some table salts can weigh twice as much as kosher salts, which we wouldn’t know if we measured them out in a tablespoon. This can lead to over-salting foods if they aren’t measured out properly. Obviously, for liquids you would still use measuring cups. Harold’s fourth tip regards basting. He mentioned that he enjoys basting his turkey because it slows the cooking time of the bird. You may be thinking- MORE time in the oven? But it actually makes sense. By basting throughout the cooking time, you can keep checking the temperature of your turkey, ensuring that you don’t overcook it. You don’t want to put all of that effort into cooking the turkey and come out with dry breast meat. However, there is one trade off to basting: this method usually leads to less of a crispy skin. His last tip on the radio show that I wanted to mention had to do with instant read thermometers. For Thanksgiving, it’s essential to have a good instant thermometer so you can check on the bird without having to wait very long for a reading. Many thermometers on the market say they are instant read, but can take up to a minute to find the actual temperature. While waiting for your reading you are standing there with the oven door open. Therefore, spending a little extra on a good thermometer is worth it, and Harold recommends buying one with a skinny probe that can read temperatures almost instantly and will not leave a big hole in your food. I recently picked up a Super-Fast Thermapen at Amazon. It is expensive but by far the fastest instant thermometer I could find on the market and has the best reviews. I’m not sure how they called my other thermometers instant when they took 20 to 30 seconds to get an accurate reading. The Thermapen takes only 3 seconds. You can also buy a meat thermometer with an external digital reader. They even make them with remotes so you can keep track of your bird’s temp while setting the table or watching football. According to Cooks Illustrated, the Taylor Wireless Thermometer with Remote Pager Plus Timer is their number 1 pick and one worth checking out. That’s a good looking turkey photo! My sister tried the ice pack trick and it was really effective. Best turkey ever!